Cathy offers a range of creative workshops through the year. My teaching practice includes demonstrations, samples, work already stitched and visual aids, appropriate to the promotion of positive outcomes for every student. Students are encouraged to question, experiment and push me to my absolute limit! On offer, to elevate confidence and skill, is a series of project and technique based workshops, promoting creativity and inspiration to develop beautiful textures and patterns along with a love for the versatility of machine work. There is something here to appeal to anyone as interested in the decorative stitch and its applications as I am. Shops, schools or groups, please don’t hesitate to contact me via the contact button below. 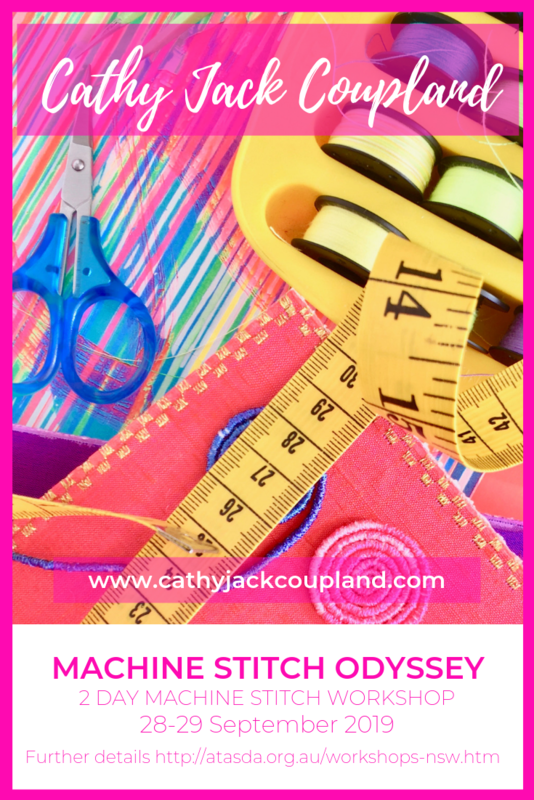 Atasda Machine Stitch Odyssey Saturday 28th and Sunday 29th September 2019. 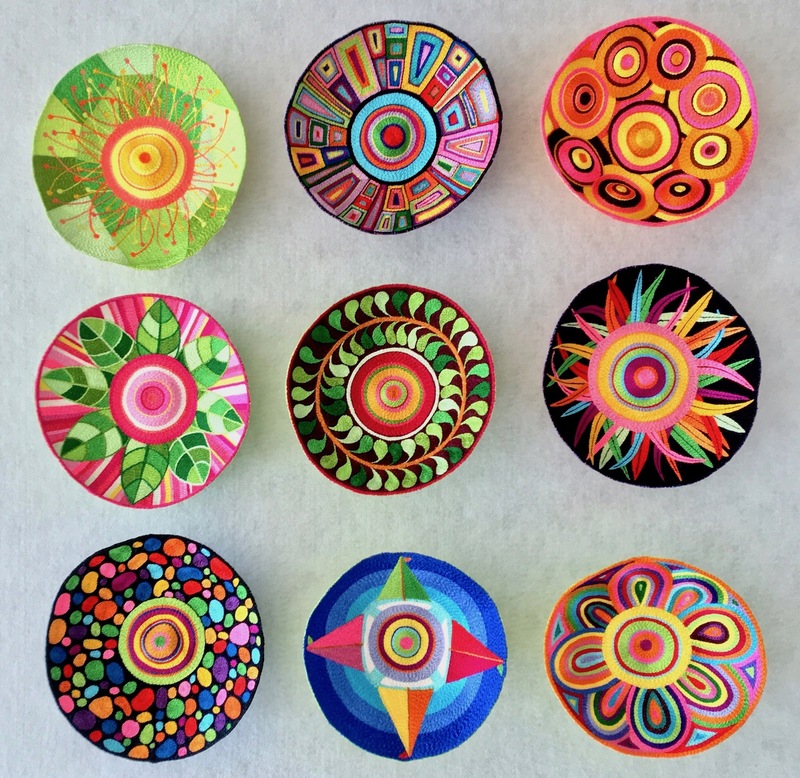 Use your creativity and imagination to design your very own bountiful bowl! Made from felt and thread, these gems will take pride of place in any studio or workroom, as a gift for that special person or as contemporary textile art to hang in pride of place. Stitched using my thread painting technique, these artworks are addictive. Each is finished with a separate base enabling the work to stand easily. Why stop at one? 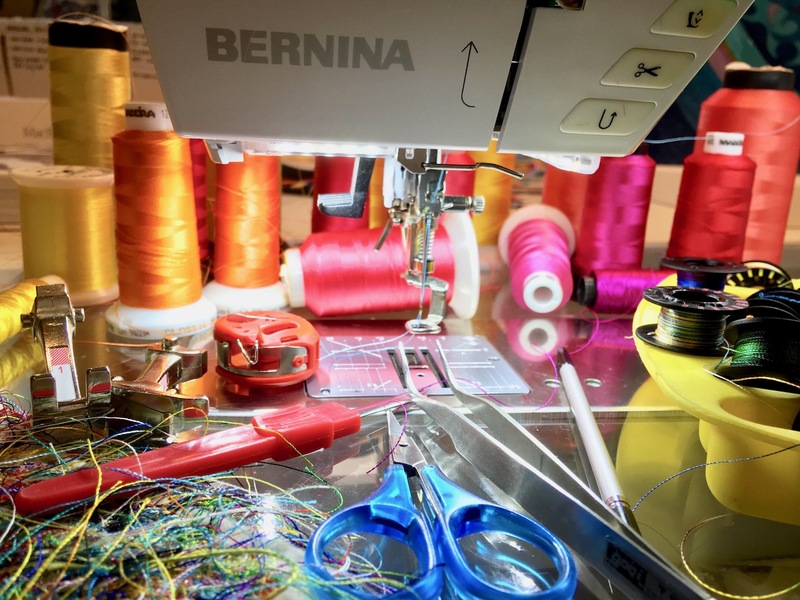 This two-day workshop will suit those with some machine stitching confidence, although the technique itself is not difficult. All stitching is done with the feed dogs lowered. Techniques: Free Machine Embroidery/Thread Painting, Stitching with multiple threads. Join an amazing two-day stitch odyssey exploring some of the creative options using your domestic sewing machine. Be encouraged and inspired to experiment using unusual stitch combinations and unique art threads to achieve bewitching textures, working from the front and back. It can be done! There will be numerous stops along the way to explore the bounty of stitches already programmed into your machine. Try some different feet, drop those feed dogs and delve into the endless possibilities available to you. Over the two days, you will experiment on a length of fabric to deepen your knowledge of just what you can do with your machine. You will be encouraged to keep a written travelogue of all the awesome work you do. This workshop is designed to afford confidence, while stretching knowledge and ability. You will work with feed dogs up and down, with an embroidery and darning foot, thick and thin threads, multiple threads, working from the back, stitching onto paper and using water solubles. You will learn how to make beads and a simple tassel to add dimension and pizzaz to your work as well as how to stitch over wire and make machine-made cords. Phew! Be inspired, be daring and be creative. Most of all be passionate. Climb aboard. There’s a world of machine made stitch just waiting for you. This is just the beginning and it starts with you! Techniques: Decorative Stitching/Stitch Recipe, Stitching with multiple threads, Stitching with solubes, Stitching onto paper, Beadmaking. Do you love the decorative stitch? Do you love pattern, texture and colour? In this one day workshop, reveal the beauty of what you already have; the pre-programmed decorative stitches already on your domestic sewing machine. Make your very own stitch recipes and make them unique! Experiment with a little bobbin work using thicker thread, working from the back. Combine stitching with feed dogs up and down, enhancing those decorative stitches with free machine work. Add some applique using organza, then finish off with an elegant, machine made tassel. Sublime! 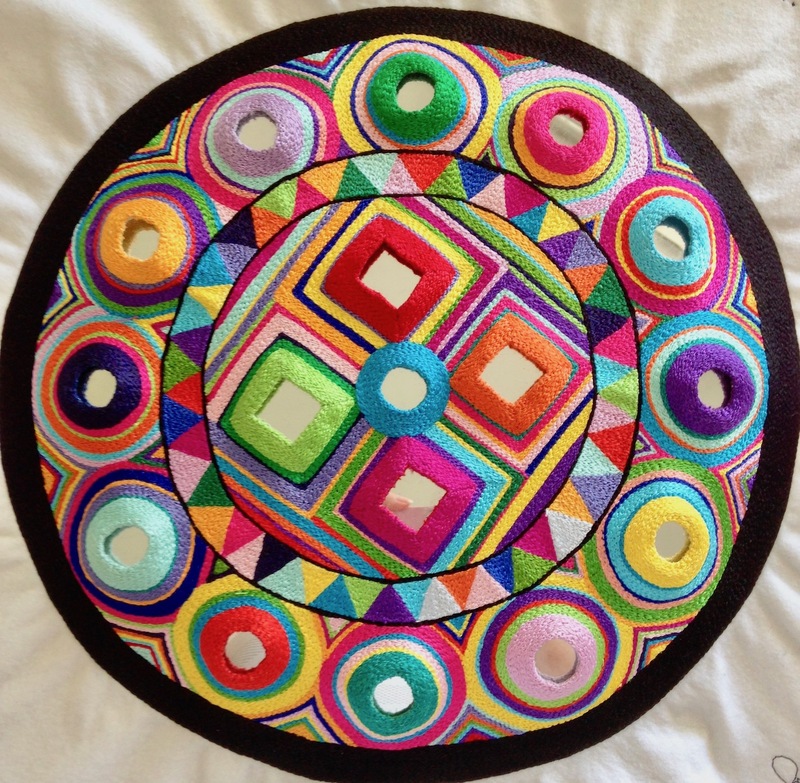 These decorative techniques could be used on collars, cuffs, shirt fronts, cushions, fashion, re-purposed fashion, bags, homewares and textile art. Do you keep thread of-cuts? 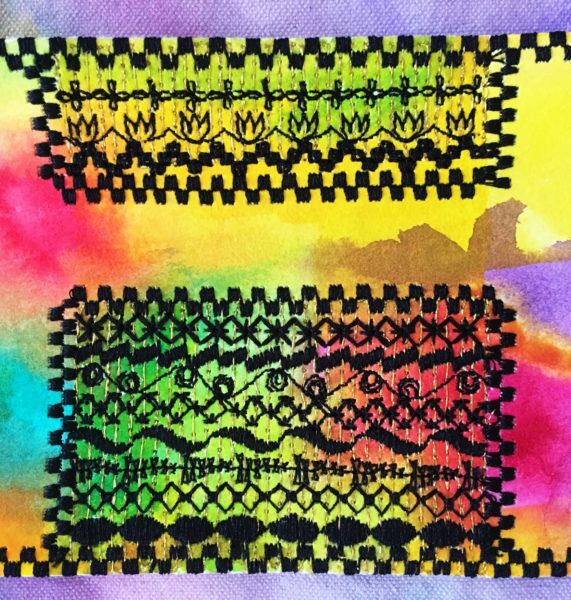 Then put them to good use in this one-day workshop where you’ll learn to work with water soluble material and sumptuous thread. Make your very own bespoke bowl, perfect to cradle those prized threads we all just love to collect, stitch bedazzling beads and fashion sumptuous Christmas ornaments. Create opulent, luxurious and elegant textures using those myriad thread tails, as well as gain confidence in a number of techniques. 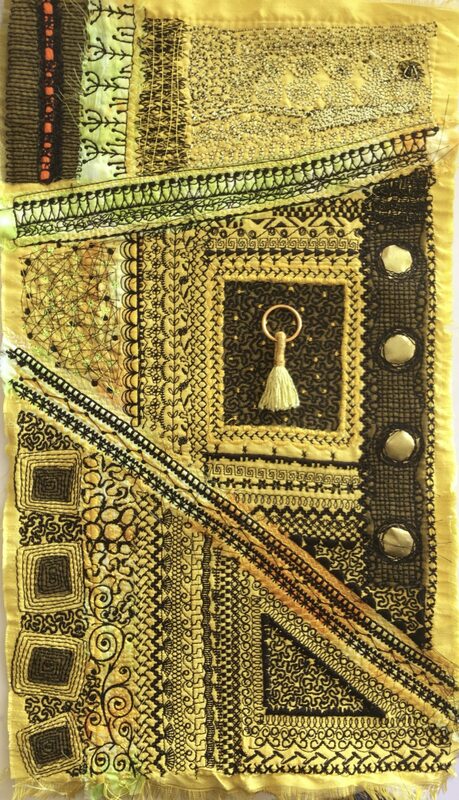 This work could be used as applique on bags, cushions, fashion, jewellery, homewares, millinery or as stand-alone dimensional textile art pieces. Let your imagination soar in this workshop. The sky’s the limit! Techniques: Stitching using water soluble materials, Free Machine Embroidery, Stitching with multiple threads, Stitching with metallic/holographic thread. Use the decorative stitches already programmed on your machine to create lusciously seductive braid, absolutely bursting with colour, texture and style! Be bold and audacious with your colours, or be seductive and tantalizing using a magnificent monochromatic palette. Think red on red, blue on blue or white on white. Tres élégant! Why stop there? 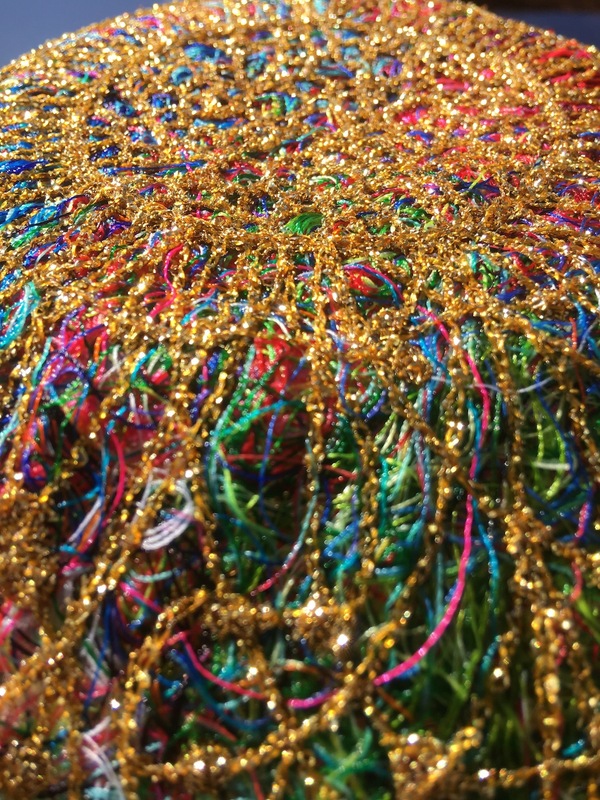 What about adding even more texture with bedazzling beads, sequins or hand embroidery using art threads? Once you gain confidence in this technique, give your imagination free-reign to experiment. No more boring braid, ever! 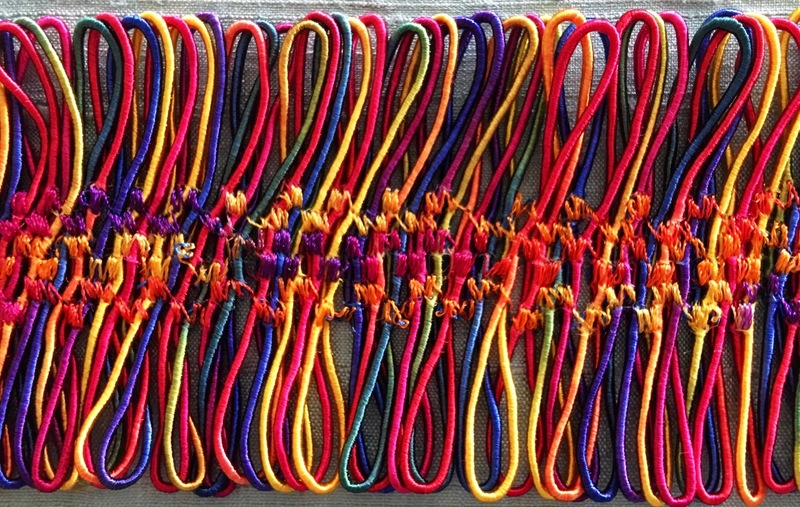 Your bespoke braid may be used on garments, homewares, cushions, millinery and in textile art. Techniques: Decorative Stitching, Free Machine Embroidery, Hand Beading, Hand Embroidery. Yes, Shisha (or Shisha type) mirrors can be stitched by machine! Take a deep breath and give this technique a go. In one day, learn how to stitch mirrors ‘my way’. It’s tricky, fiddly and totally addictive! Join me and bring a contemporary feel to a very traditional technique. Begin by understanding how to assemble each mirror safely, then when you’re confident with the technique, then fly and design your own, unique piece. This technique could easily grace garments, homewares, cushions, jewelley, Christmas ornaments, millinery and dimensional textile art. Techniques: Contemporary Shisha Work, Free Machine Embroidery, Stitching with multiple threads.